Hi there, I would like to share with you a release from Special Recordings, the new Cobalt’s sublabel. Incursion contains twelve tracks from Diego Iglesias, Lukas Greenberg, John Scott, Esemdi, D-White Noise, Motego Muzik and more! It’s available now on the main digital stores as Amazon Junodownload and iTunes (slight delay in delivery to Beatport, will be for sale there soon..). Update: it’s now available on Beatport too. You could take a listen to it on the player below. Cobalt Recordings has started a new sub-label called Special Recordings. Special will release Progressive House, Trance, and Electro-house. We have started this new sub-label due to the high amount of quality demos we have received in these genres. Also we wanted to make sure Cobalt, PMR, and Special Recordings all have a strong identity and a streamlined point of view. Leave a message if you enjoy this release! 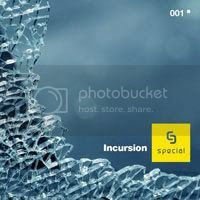 Get Special Recordings – Incursion: Amazon.com, Junodownload, iTunes, Beatport. Ero – “The Flux” (Diego Iglesias remix) appers on the Anjunabeats Worldwide 107 by Oliver Smith!